The concept of a “free and open Indo-Pacific” (FOIP) means many different things to different regional stakeholders in Northeast Asia, Southeast Asia, the Indian Ocean Region (IOR), Australia, the United States, and the European Union. Considered as an extension of the U.S.-led Asia-Pacific security concept to the Indian Ocean region, its realization is nebulous. No regional power can predominate throughout the IOR, which encompasses three U.S. Areas of Operational Responsibility (AORs): Indo-Pacific Command, Central Command, and Africa Command. Indo-Pacific Command was previously known as Pacific Command, and this renaming has provoked significant operational and cooperative confusion: does it imply a new mission for this AOR? And why are the words “Free” and “Open” now being applied to the sea routes of the Indian Ocean, which have rarely been constrained by maritime threats? Freedom of navigation there has only been disrupted by the 1980s Iraq-Iran War, occasionally by the Sri Lanka Civil War, and by the more recent problem of Somali pirates. The reason for the new language is surely China. Its growing naval prowess and its vast economic project known the Belt and Road Initiative (BRI) are both underpinned by China’s wide-ranging historical claims. Besides acquiring a foothold in some of littoral and archipelagic states of the near IOR, China also aspires to expand into Africa and beyond. China’s motivation remains unclear, however. Is it simply aiming to become a regional power around the IOR, establishing China-friendly regimes in Pakistan, Sri Lanka, Central Asia, and the Middle East; and perhaps to foment trouble for Europe and the United States in Saudi Arabia and Iran? Or does China intend a serious ideological challenge to the existing rules-based order by forming client-states and promoting an autocratic trading regime that disrupts freedom of navigation? Besides freedom of navigation, core tenets of the U.S.-led global order, in the IOR and elsewhere, include respect for the rule of law, national sovereignty, open markets, and popular democracy. However, the United States seems less concerned these days about preserving the IOR’s liberal trading regime and its system of mutual security assurance. China, meanwhile, uses grandiose (and highly dubious) historical claims to justify its expansionism, both economic and military. Clearly, there is a manifest threat to FOIP. South Korea has long been deeply involved in the prevailing strategic concept of the Asia-Pacific, but is much less comfortable with the conceptual remapping which the United States is now pursuing through its vision of FOIP. The Indian Ocean is an ancient sphere of interest for South Korea, with economic and political interaction between the Korean and Indian Peninsulas going back more than 2,000 years; Korea also has historical links to Arabia and Europe. The term “Indo-Pacific” in South Korea has been debated since U.S. President Donald Trump’s state visit to South Korea in 2017, when Washington included it in a joint statement about regional peace and stability, surprising Seoul. At the time, the term was understood as referring to countermeasures in response to the rise of China, and South Korea, given its geographic position and strategic constraints, has been necessarily ambivalent on such language. The prospect, now, of an explicit strategy to realize FOIP, is even more difficult for South Korea, with policymakers and security analysts keenly debating whether it is merely a controversial mental mapping, or an overarching grand strategy for the region. Seoul’s preferred interpretation can be seen from Indian Prime Minister Narendra Modi’s recent state visit to South Korea, from February 21 to 22, 2019, during which the agenda focused upon economic and defense cooperation, not on FOIP per se. From a South Korean perspective, FOIP is simply a recasting of the maritime security agenda, and it is not obvious how South Korea could make a contribution to any grand strategy. Safeguarding the Sea Lanes of Communication (SLOC) in the IOR has always been the principal emphasis, and thus far has mostly focused on terrorism and the impact of climate change. On the former issue, the 27th Chenghae Naval Task Unit is committed to anti-piracy patrols off the eastern coast of Africa, despite the heavy demands for the South Korean navy in deterring North Korean maritime threats; and on the latter issue, the existing sea routes will continue to predominate, despite the possibility of the Northern Sea Route opening up. 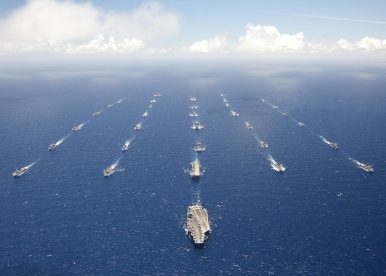 In contrast to the current low profile of South Korea, Japan has shown much more enthusiasm for the concept of FOIP, implementing the so-called Diamond Strategic Alliance structure between the United States, Japan, Australia, and India through the revival of the Quadrilateral Security Dialogue (the Quad) on maritime cooperation. Some critics have minimized South Korean interests in the IOR as limited to anti-piracy operations. But if the ongoing North-South Korean dialogues continue to prosper, and if relations between the United States and North Korea improve, then South Korea may be expected to play a more dynamic role as an emerging major stakeholder in sustaining FOIP. South Korea enjoys numerous advantages from freedom of navigation in the IOR, and some of South Korean President Moon Jae-in’s ideas, such as the New Southern Policy, can be readily integrated with U.S. strategic interests on FOIP. Nevertheless, it is not easy to identify the implementation of FOIP as a central concern in South Korea’s economic interest. The United States has redefined its strategic concerns by shifting its military objectives from the Asia-Pacific to the Indo-Pacific, but this is of little direct relevance for South Korea. If the United States intended FOIP to effectively counter Chinese expansionism, it appears to be too little too late. Besides the Quad, other recent FOIP policies include the Indo-Pacific Economic Partnership and the Asia Reassurance Initiative Act, but these look trivial in comparison to China’s huge BRI project and the ever-growing Chinese military presence in the IOR. If China intends for its infrastructure investments to persuade governments receiving its largess to abandon the prevailing liberal economic order and turn to more transactional and authoritarian trading and energy-supply interactions, then the United States is making no serious efforts to prevent this. If Washington decides to try harder to preserve FOIP, then some steps are feasible, and others are unhelpful. Feasible steps include: multilateral strategic engagement with concerned countries to support the global rules-based order; various multilateral measures to safeguard maritime security and good order in the Indian Ocean, aiming to establish a common strategic narrative between IOR insiders and outsiders by trying to preserve free and open SLOC as well as supporting democratic institutions and societies around the IOR; and formalizing a set of mutual obligations to ensure a legal right of freedom of navigation at sea, based on the United Nations Convention on the Law of the Sea (UNCLOS). Unhelpful steps include: any rapid containment or direct confrontation, with China or any other country, much less physical conflict or indeed war; any interpretation of FOIP that tends toward an increasingly mercantilist and nationalist stance, with a more combative military (this cure would be worse than the disease); and treating FOIP as only applicable to the IOR, when the underlying principles should of course be extended to the whole Asia-Pacific region. I would suggest a few policy-oriented recommendations. First, the region has to establish a common understanding of FOIP; this should be articulated in terms of geography and/or strategic implications. At present, major stakeholders disagree on the scope of FOIP. The United States applies FOIP from the South China Sea to the western AORs of the Indo-Pacific Command, whereas India and ASEAN insist that FOIP should be of equal strategic value in the Asia-Pacific region — FOIP should apply from the Gulf of Aden to the Pacific coast of the United States. Second, the U.S.-led multilateral biannual RIMPAC exercises should be held throughout the IOR, instead of merely in the Asia-Pacific region. As a good first step, RIMPAC 2018 included the navies of Sri Lanka and Israel for the first time. The Chinese navy should also be invited again, to promote maritime security cooperation. Moreover, the same argument applies to other multilateral maritime security exercises, such as Exercise Malabar, which should also invite the Chinese navy. FOIP should not be allowed to devolve into an excuse for rival blocs to face off against one another. Third, China should show its goodwill by not using the IOR as a pivot to expand its naval presence even further, to the Mediterranean Sea, the Atlantic Ocean, the Black Sea, or the Baltic Sea. China should also demonstrate its theoretical and practical understanding of the global rules-based order in the IOR, by complying with prevailing norms to preserve maritime good order and security. China should take care to ensure that its ambitions in the IOR are not misinterpreted as the militarization of region, since the regional reaction to any such over-assertive actions would likely be counterproductive. If China so chooses, FOIP can become protection for all stakeholders in the Indo-Pacific region, rather than a tool designed specifically to impede China. In conclusion, the terms “free” and “open” should be seen as useful and appropriate for the IOR. If some stakeholders find them uncomfortable, then they should reconsider their own actions and intentions in the region. Captain Sukjoon Yoon, ROK Navy retired, is a senior fellow at the Korea Institute for Military Affairs.